Any Super Smash Bros. Melee player will tell you that its fans are dedicated and particular. If you play seriously, you will play on a CRT for minimal lag with a brand new GameCube controller. And you will never, ever touch Pichu. At the Genesis 4 Smash tournament, which started today, Red Bull esports installed some very special custom Melee cabinets. CRTs fit inside the display. Wiis are built into the front. The dashboards have cup holders. The paint job is impeccable. There are about 20, they are everything and I would pay stupid money for one. 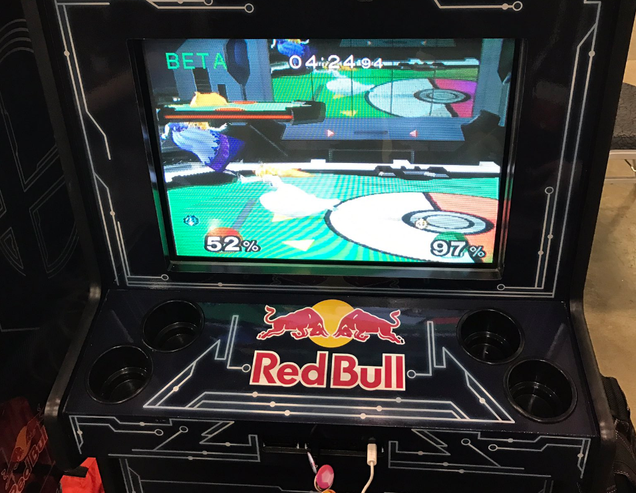 Alex Jebailey, founder of CEO Gaming, told me that Gen4 attendees have been playing the cabinets nonstop since last night. “It’s special because it’s never been done before in more than a one-off, to my knowledge,” he said. I say, bring back arcades. Let’s stock one with a few dozen of these babies.